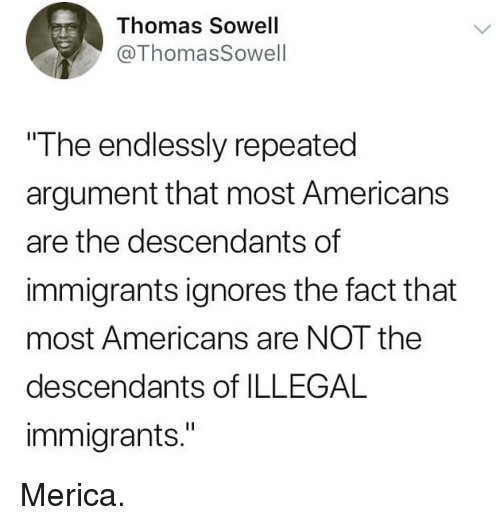 Memes, Thomas Sowell, and 🤖: Thomas Sowell @ThomasSowell The endlessly repeated argument that most Americans are the descendants of immigrants ignores the fact that most Americans are NOT the descendants of ILLEGAL immigrants." 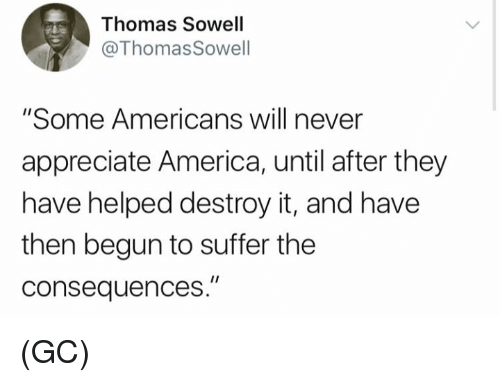 Merica. 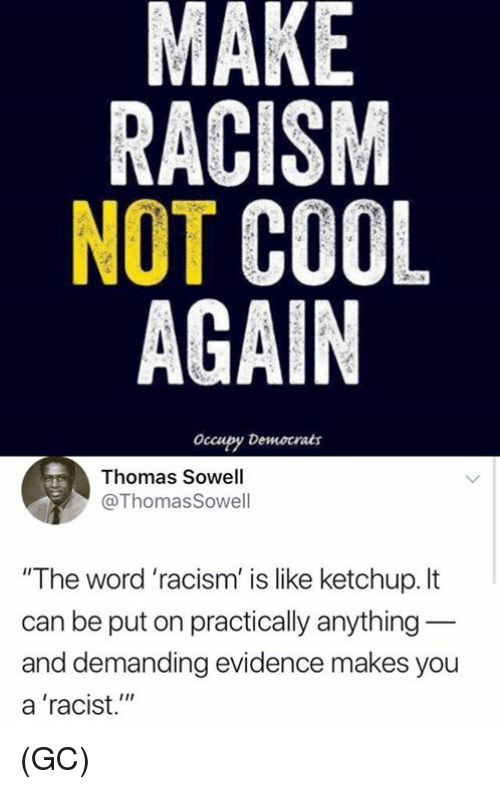 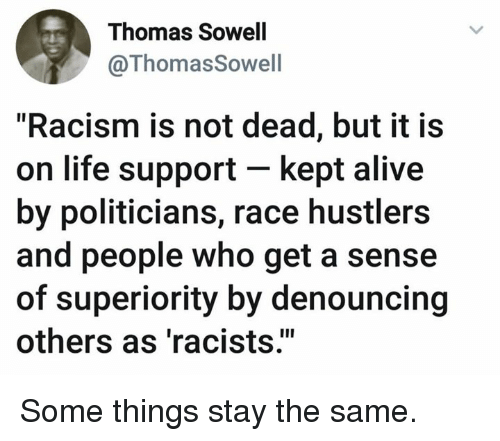 Alive, Life, and Memes: Thomas Sowell @ThomasSowell "Racism is not dead, but it i:s on life support - kept alive by politicians, race hustlers and people who get a sense of superiority by denouncing others as 'racists" Some things stay the same. 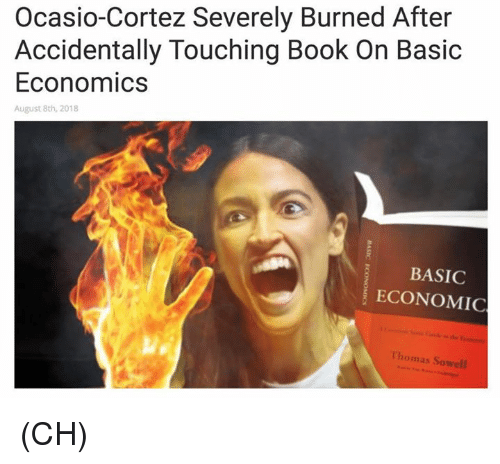 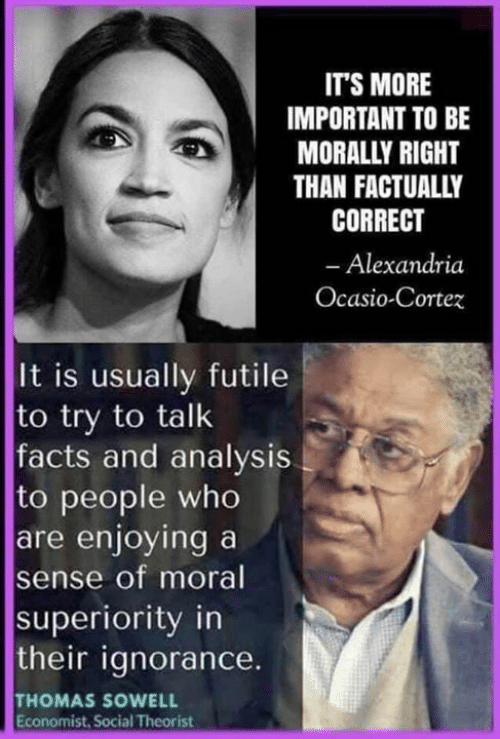 Facts, Memes, and Politics: It is usually futile to try to talk facts and analysis to people who are enjoying a sense of moral superiority in their iqnorance. 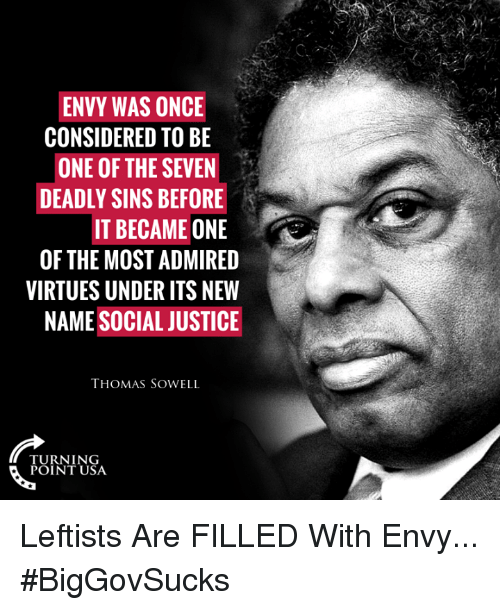 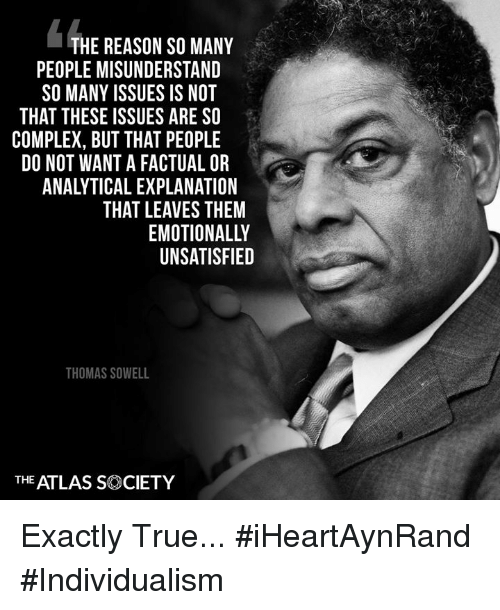 THOMAS SOWELL Economist, Social Theorist Why arguing politics with liberals is often a waste of time. 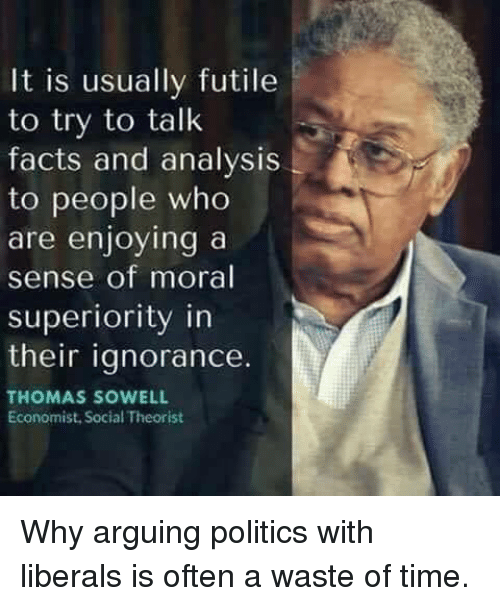 Why arguing politics with liberals is often a waste of time. 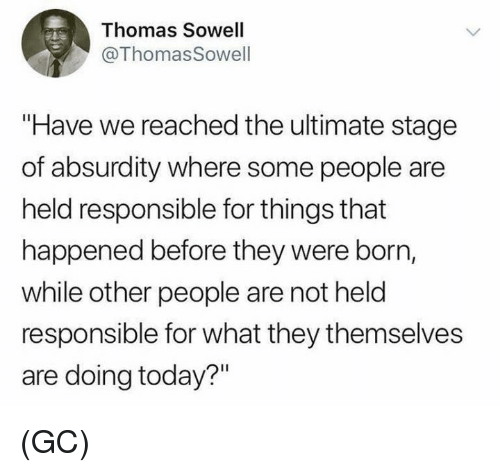 Cars, Children, and Guns: Thomas Sowell, who is one of our favorite commentators, points out three things that make the collectivists uneasy. 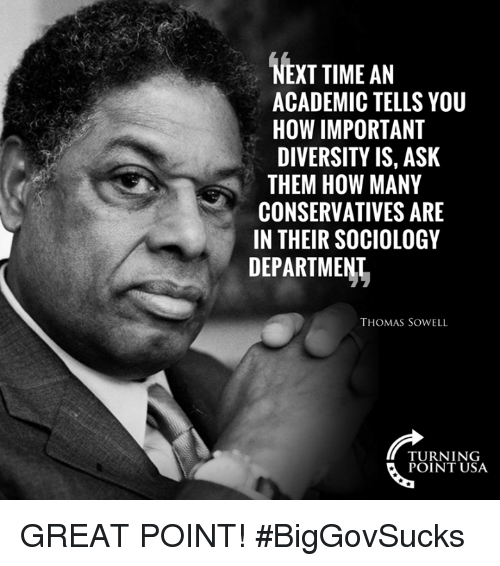 These are cars, guns and home schooling, all of which grant to the individual a degree of independence of action which terrifies the champions of the super state. 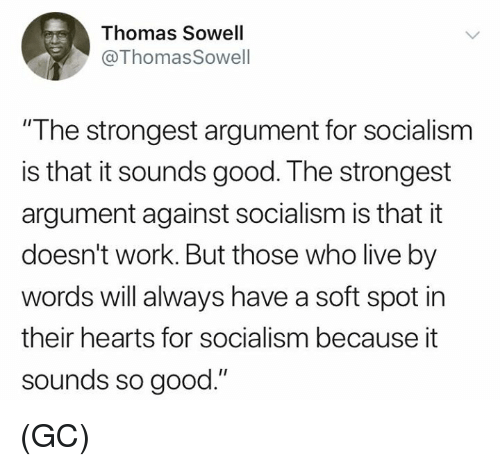 Cars, guns and home schooling reduce the need for the statism so prized by the socialists. 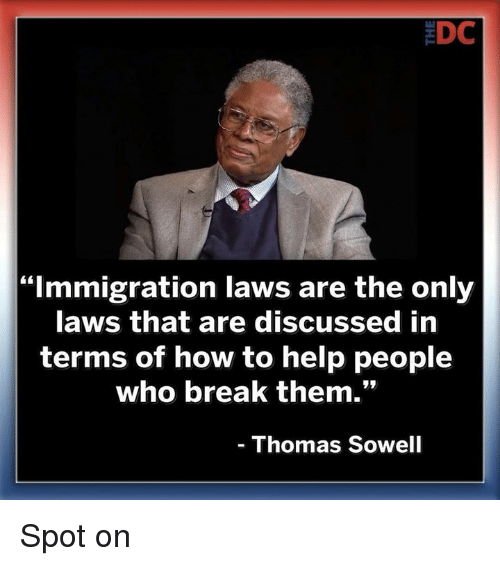 They do not wish you freedom to move around. 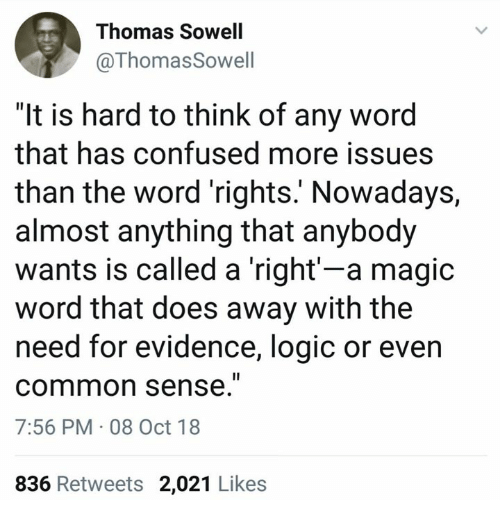 They do not wish you to be able to protect yourself. 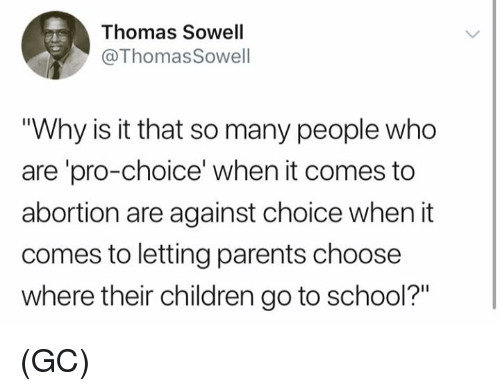 And they do not wish you to decide what your children should be taught. 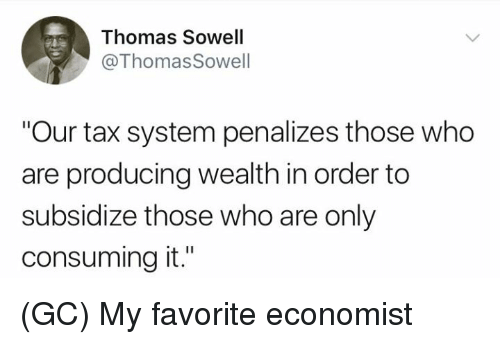 Such things reduce the power of the state over the citizen. 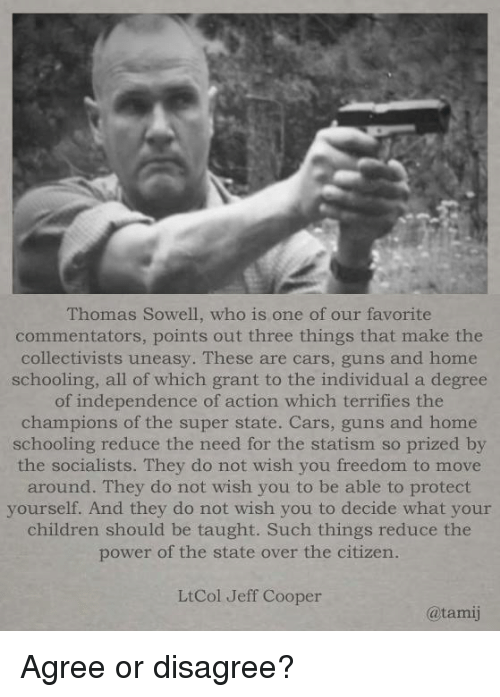 LtCol Jeff Cooper @tami Some things NEVER change! 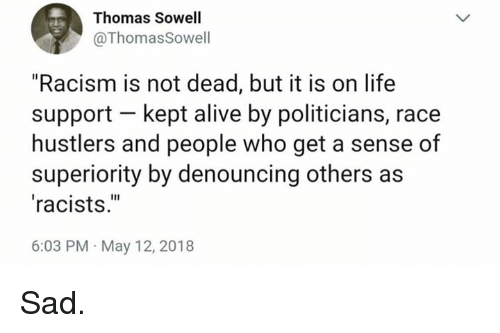 Alive, Life, and Memes: Thomas Sowell @ThomasSowell "Racism is not dead, but it is on life support kept alive by politicians, race hustlers and people who get a sense of superiority by denouncing others as racists." 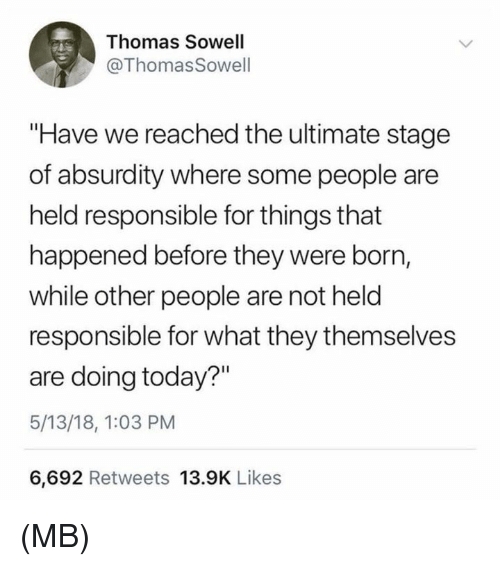 6:03 PM May 12, 2018 Sad. 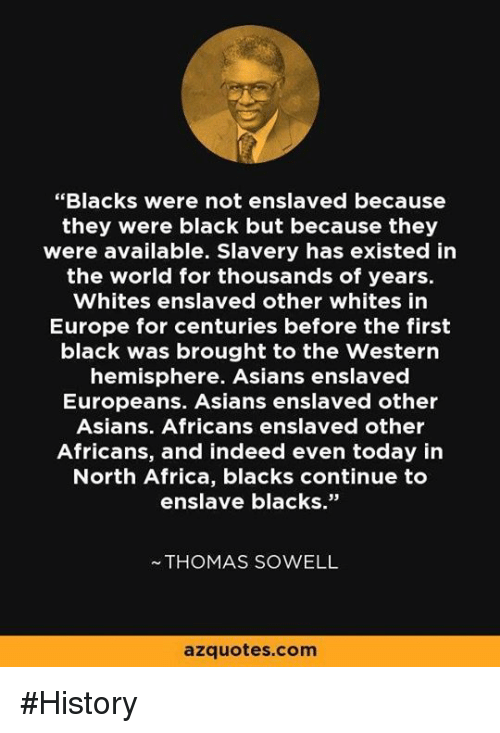 Africa, Facts, and Memes: "Blacks were not enslaved because they were black but because they were available. 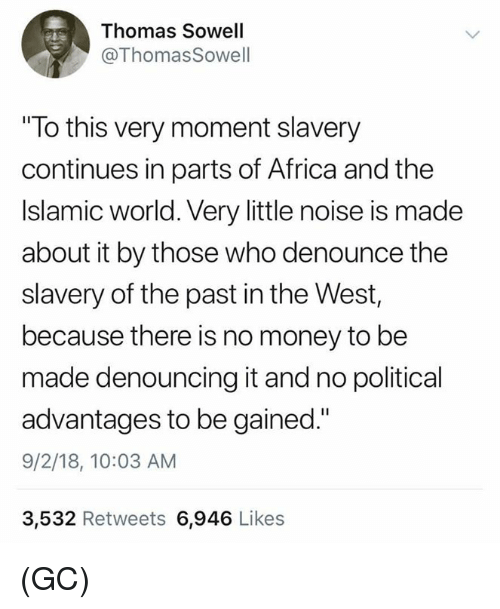 Slavery has existed in the world for thousands of years. 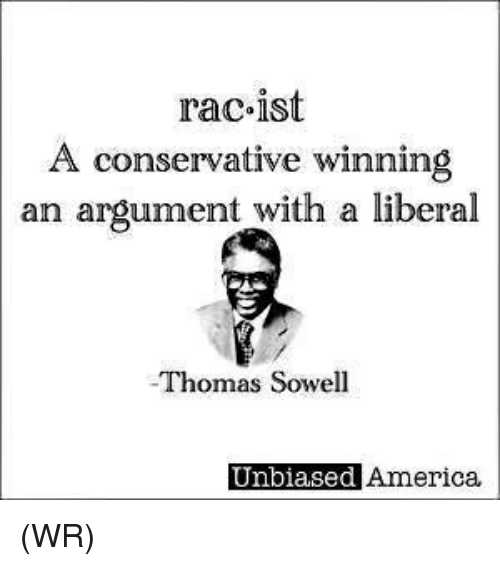 Whites enslaved other whites in Europe for centuries before the first black was brought to the Western hemisphere. 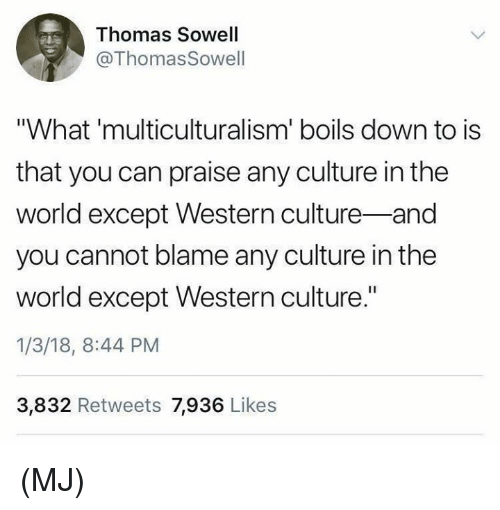 Asians enslaved Europeans. Asians enslaved other Asians. 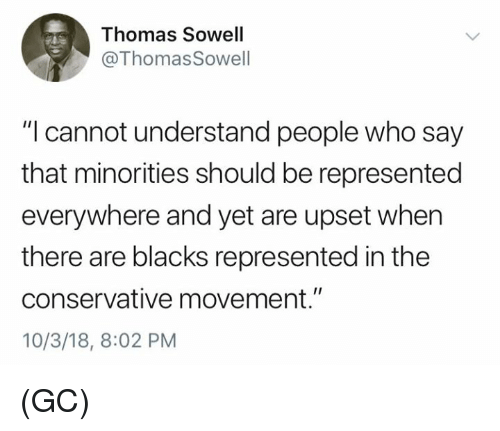 Africans enslaved other Africans, and indeed even today in North Africa, blacks continue to enslave blacks." 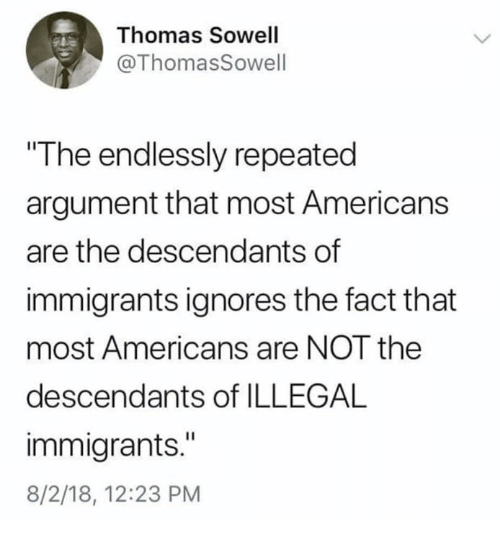 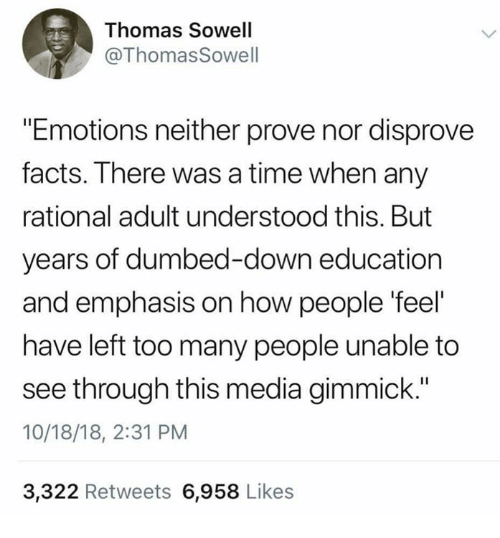 ~THOMAS SOWELL azquotes.com Facts matter. 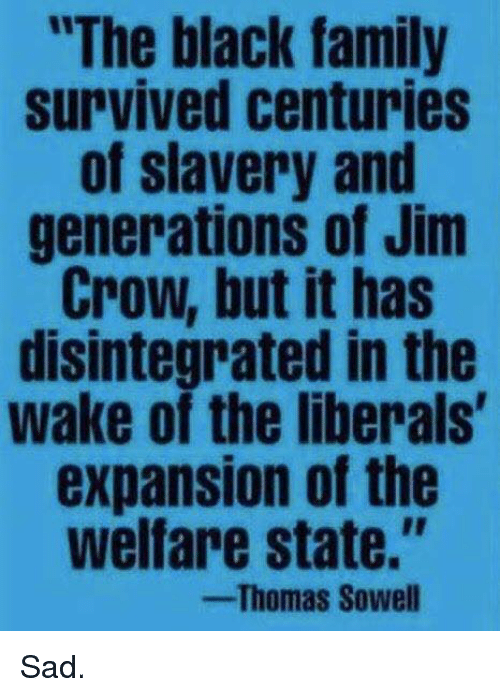 Family, Memes, and Black: "The black family survived centuries of slavery and generations of Jim Crow, but it has disintegrated in th wake of the liberals expansion of the welfare state." 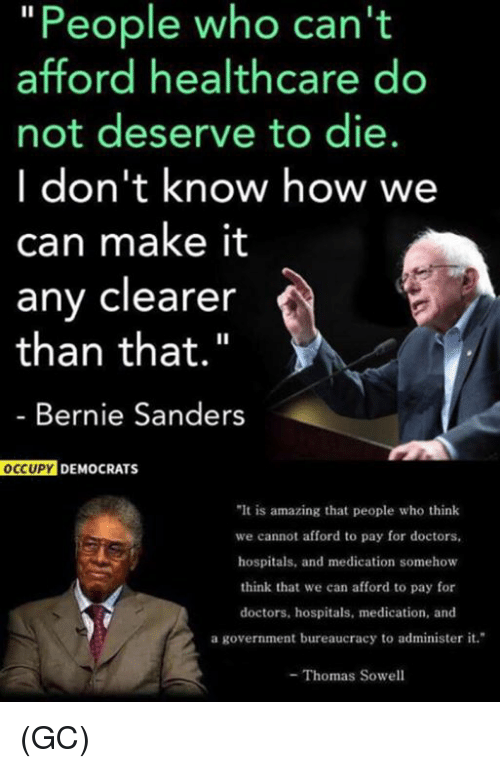 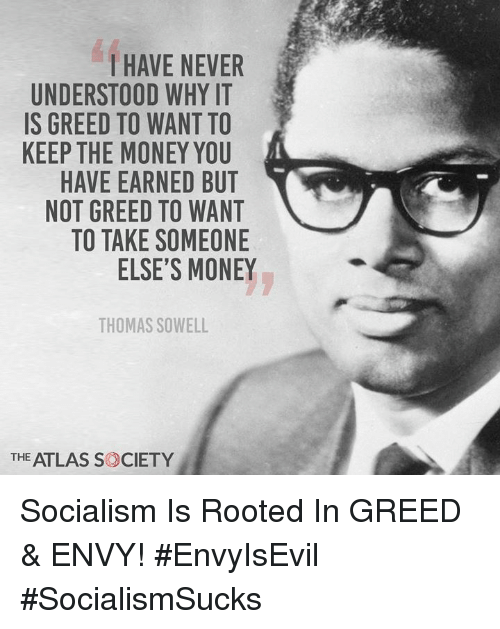 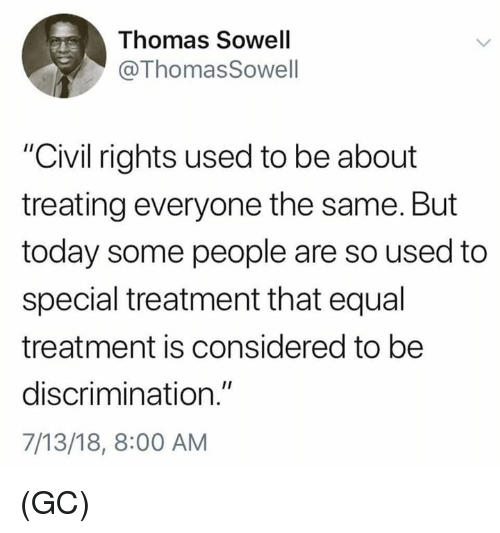 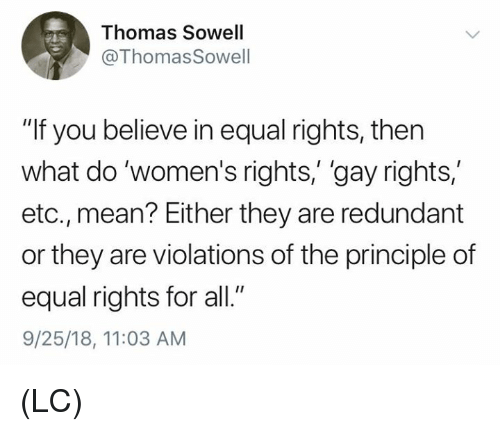 Thomas Sowell Sad. 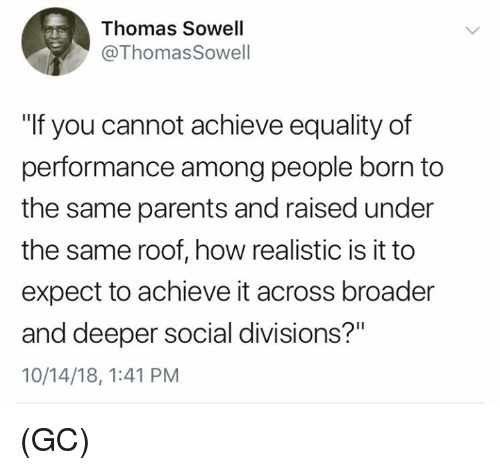 Cars, Children, and Guns: Thomas Sowell, who is one of our favorite commentators, points out three things that make the collectivists uneasy. 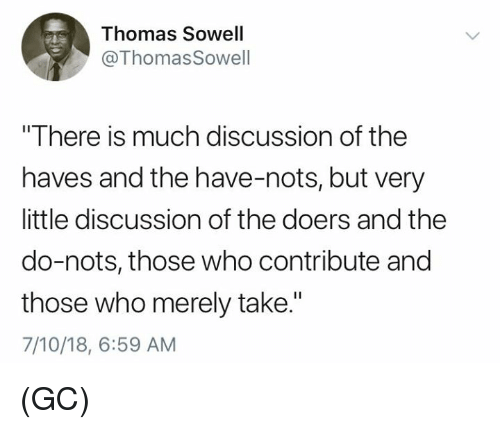 These are cars, guns and home schooling, all of which grant to the individual a degree of independence of action which terrifies the champions of the super state. 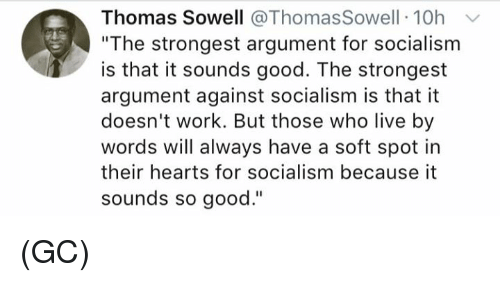 Cars, guns and home schooling reduce the need for the statism so prized by the socialists. 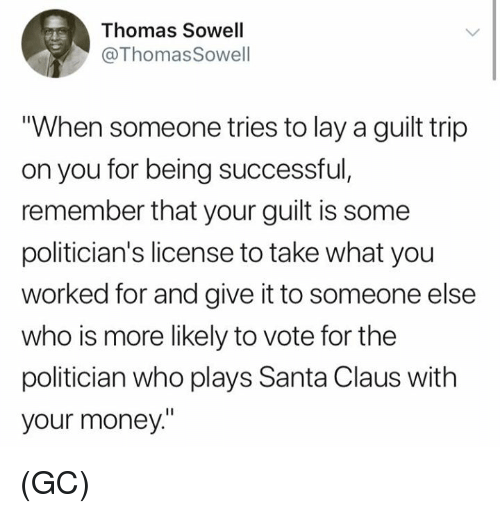 They do not wish you freedom to move around. 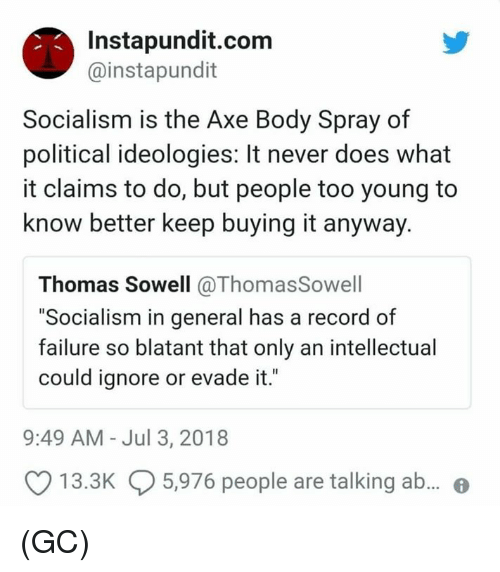 They do not wish you to be able to protect yourself. 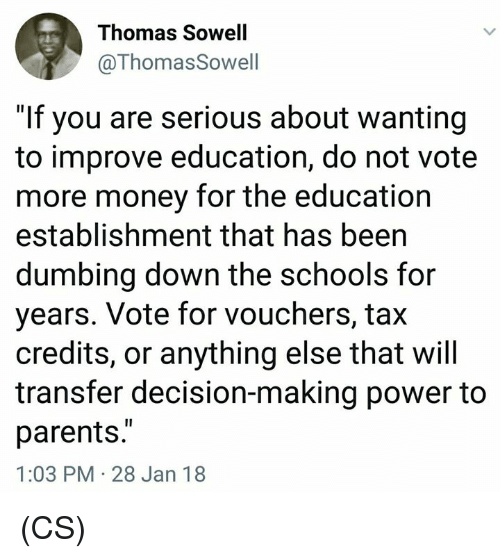 And they do not wish you to decide what your children should be taught. 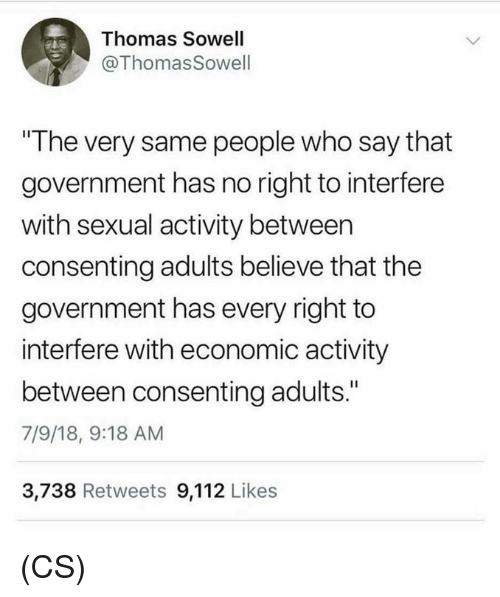 Such things reduce the power of the state over the citizen. 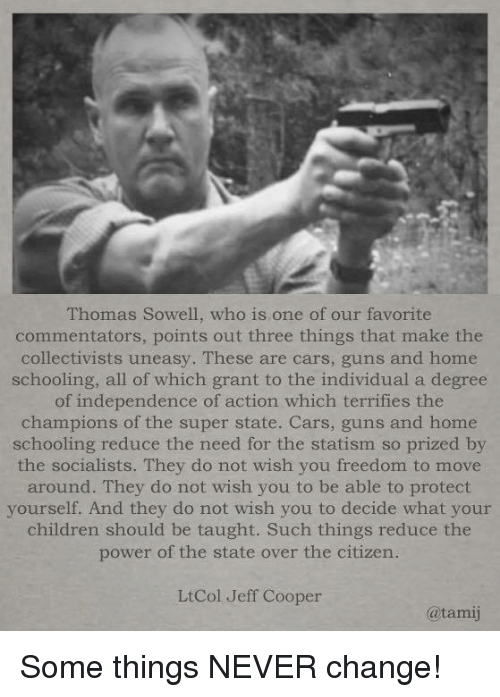 LtCol Jeff Cooper @tamij Agree or disagree? 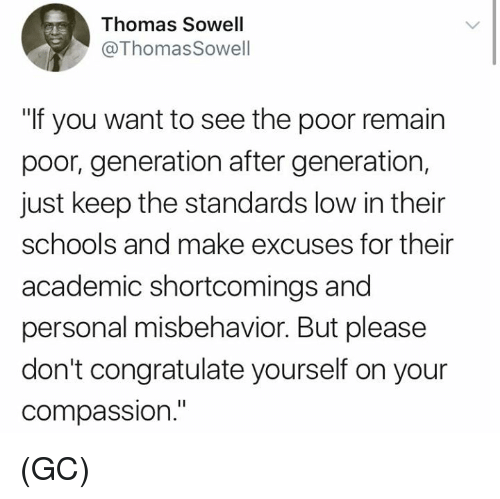 Goals, Memes, and Common: The real motives of liberals have nothing to do with the welfare of other people. 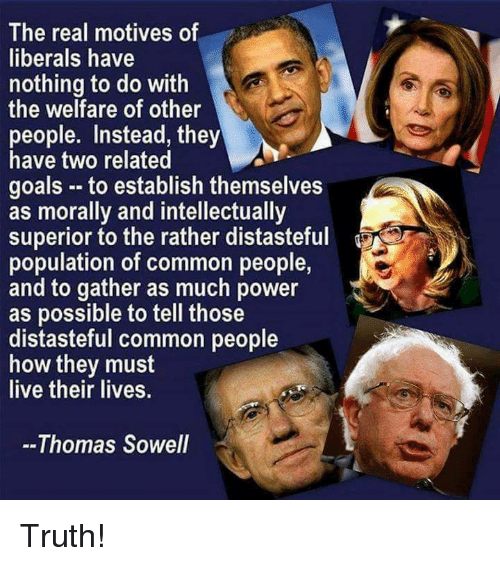 Instead, they have two related goals - to establish themselves as morally and intellectually superior to the rather distasteful population of common people, and to gather as much power as possible to tell those distasteful common people how they must live their lives. 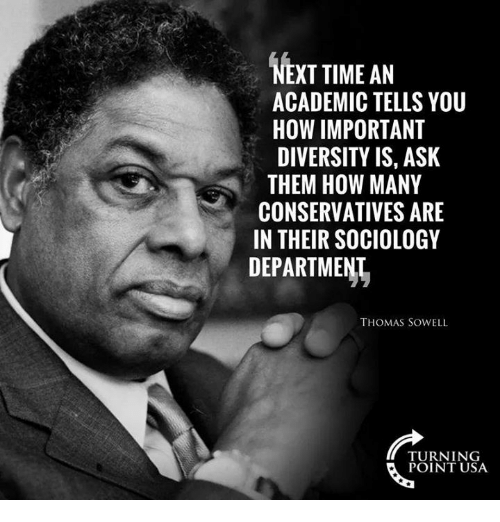 --Thomas Sowell Truth! 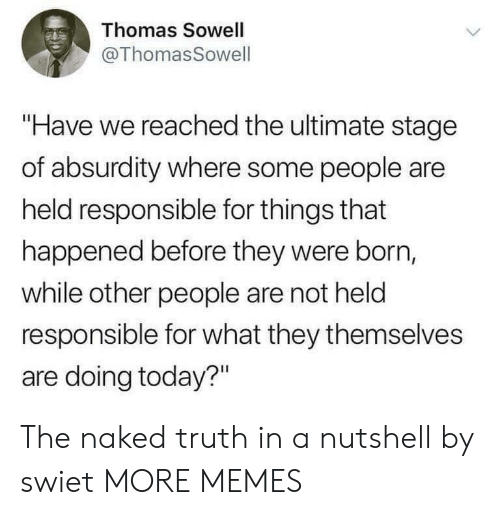 Memes, Politics, and Time: NO ONE WILL REALLY UNDERSTAND POLITICS UNTIL THEY UNDERSTAND THAT POLITICIANS ARE NOT TRYING TO SOLVE OUR PROBLEMS. 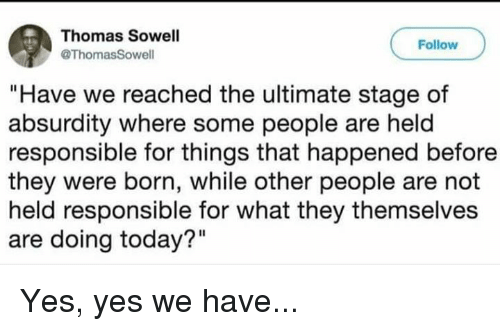 THEY ARE TRYING TO SOLVE THEIR OWN PROBLEMS OF WHICH GETTING ELECTED AND RE-ELECTED ARE NUMBER ONE AND NUMBER TWO WHATEVER IS NUMBER THREE IS FAR BEHIND. 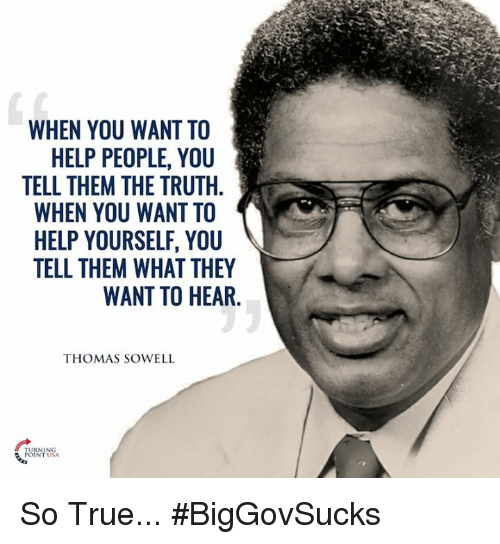 -THOMAS SOWELL Us Congress spends over half their time fundraising...No wonder they have no time to represent us. 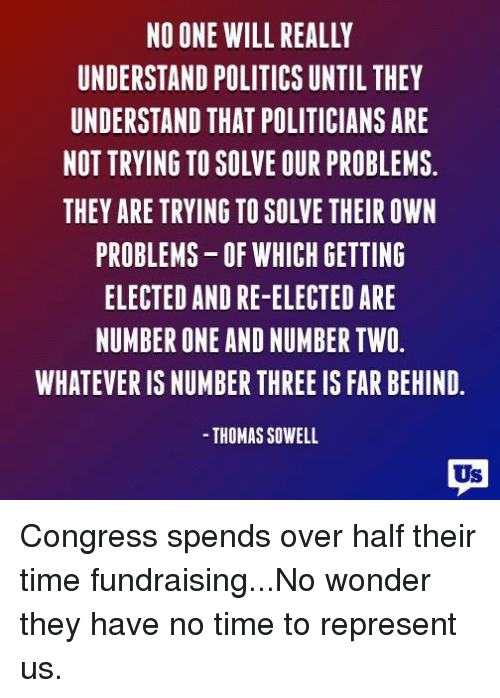 Congress spends over half their time fundraising...No wonder they have no time to represent us.